Originating in 16th Century France, buffet dining has stood the test of time and continues to be a popular choice for many restaurant customers. By definition, a buffet is a meal where guests serve themselves from a variety of dishes set out on a table or sideboard (from Food Lover’s Companion). Today there are many restaurant concepts centered around a buffet theme. Buffets are also served on special occasions or as restaurant promotions. And restaurants who offer catering services use buffets as an efficient way to feed a large number of guests. Just as the name implies, this type of buffet offers guests the most bang for their buck. Typically customers pay one price and serve themselves from different stations, ranging from hot items, a salad bar, and dessert station. Many restaurants, like Old Country Buffet or HomeTown Buffet, offer this type of service. As the obesity epidemic in the United States continues to rise, the all-you-can-eat buffets are losing popularity. Less prevalent in restaurants is the cafeteria style buffet. In this type of restaurant buffet, customers select plates of food as they pass through a line. They might take a plate with a pre-made sandwich, a plate with a dessert and a cup of soup, for example. Many restaurants will offer a buffet as a restaurant promotion or for special occasions. For example, as a restaurant promotion, a restaurant might offer a special seafood buffet on the first Friday of every month. Or they might offer a special Mother’s Day brunch buffet instead of a regular menu. Restaurants who offer catering services use buffets to feed large groups of people quickly and efficiently. Weddings, business meetings, holiday parties are all ideal situations for a catered buffet. Restaurants can also provide catered buffets off-site, expanding their business further. Some restaurant chains are built around the perception of healthy buffet choices. Soup Plantation, for example, offers a "healthy all-you-can-eat" buffet. With an array of salad bars and soups and fresh produce available, the chain features 97 units in the US. It's important to note that as restaurant menus continue to receive more scrutiny from both public health advocates and the public, many chains who emphasize "fresh," "healthy," or "organic" ingredients are coming under fire about the high calories of menu items. The most obvious benefit of a restaurant buffet is that you can feed a large quantity of people with minimal amount of staff. It is great for payroll. It also allows you to rotate the food in the restaurant kitchen faster. Buffets as special promotions can draw in customers on a budget who may not normally dine out at your restaurant. And a buffet offers a great way to cut food costs and increase profit margins, so long as you understand how to price your buffet menu. While you save on payroll, the price for a buffet, even an all-you-can-eat deal, is typically less than a traditional sit-down dinner. Buffets also require a great deal of upkeep to maintain food safety as well as aesthetics. Servers or kitchen staff should be continually checking the buffet to make sure that containers are refilled and the buffet itself is neat and clean, as well as that the proper temperatures for both hot and cold food. A classic dining option, buffets will always be a popular choice for large gatherings and other special occasions. 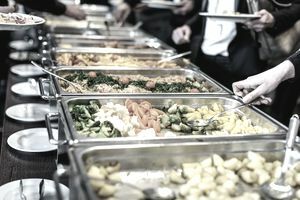 As a stand-alone restaurant theme, buffets have fallen out of favor, but they are still an excellent way to provide catering services for large crowds. Restaurant owners can dress up their buffets with elegant food and drink pairings and unique presentations.